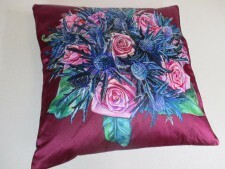 A beautiful luxurious small cushion designed by Maggie Cheek, printed with an image from one of Maggie's original oil paintings. 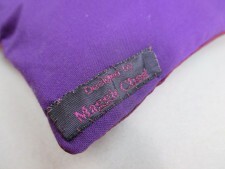 Maggie has handmade these cushions, with the face in a rich purple silk and the back in purple cotton. The pad is natural feather and the whole feel is of delicate luxury. Maggie chose special fragrant herbs and flowers from her Broadstairs apothecary which create an aroma to match the image, 'Joanna's Scottish Wedding Bouquet'. 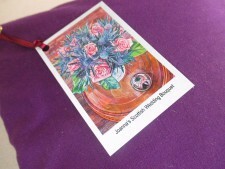 She has handsewn on her makers' label and includes a tag showing the painting and giving background to her and her work. Maggie Cheek (Margaret Foreman) is a highly established portrait painter and artist in oils. She lives in Broadstairs, Kent and won the prestigious BP Portrait Award in 1989. 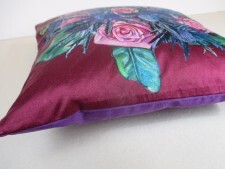 The cushion measures 12 inches / 30cm square.